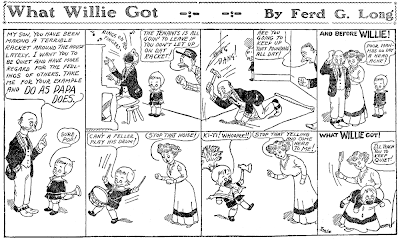 I almost hate to post this one, a sample of What Willie Got by Ferd G. Long. Long is one of my very favorite cartoonists of the era, a brush-wielding dynamo whose sense of humor didn’t have an ‘Off’ button. He produced literally dozens of different series for the New York Evening World over a span of almost twenty years. I was surprised to find that I apparently haven’t yet done a post of any of his series on the blog. 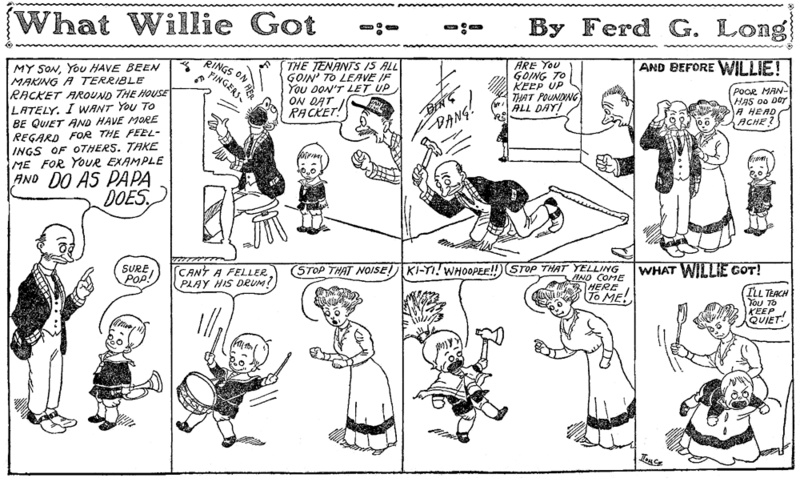 This particular strip of What Willie Got should by no means be taken as representative of Long’s work. The gag falls flat because of a bumbling set-up. I can only guess that Ferd was out late the night before he produced this one. But beggars can’t be choosers, and this sample from Cole Johnson’s archives is likely the only one I’ll ever have from newsprint. The series ran from October 11 to December 16 1909, appearing precisely eighteen times in amongst all the other series he had running. This entry was posted in Obscurities by Allan Holtz. Bookmark the permalink. This makes four “Willie” strips in a row. Are you trying to give us the Willies? Bravo Grizedo! I was wondering when someone would notice. I’ll be featuring Willies all week!